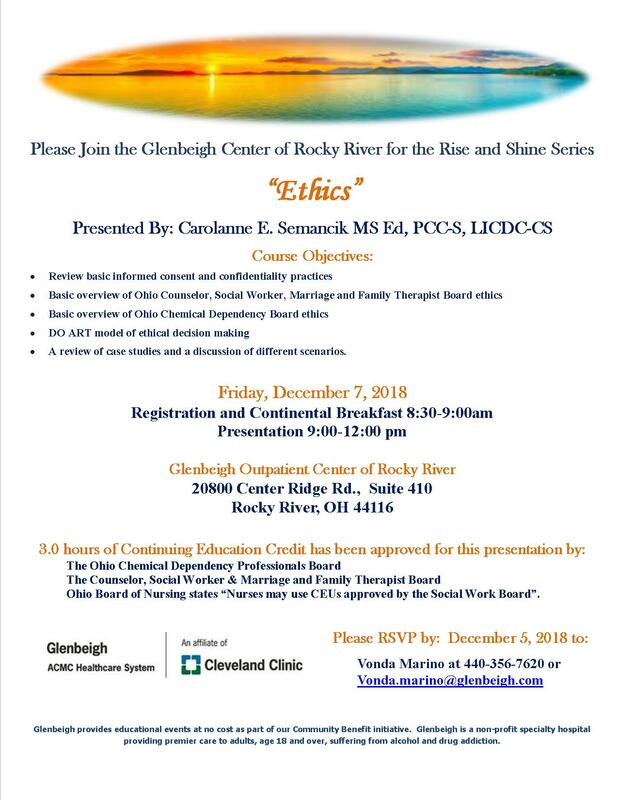 This course will review general ethics guidelines for the Ohio Counselor, Social Worker, Marriage and Family Therapist Board and for the Ohio Chemical Dependency Board. It is appropriate for individuals licensed by either board or for dually licensed individuals. The course will review portions of the Ohio Administrative Code and how they impact the ethics of the counseling and social work professions. Additionally, this course will review different ethical decision making models with a focus on the DO ART model. Example case studies and scenarios will be discussed. Carolanne Semancik has worked in the field of inpatient chemical dependency for five years. She holds a Bachelor's degree in Psychology and a Master's degree in Community Mental Health from Youngstown State University. Semancik is a Clinical Supervisor at Glenbeigh, Rock Creek. She has extensive experience in mental heath care utilizing an integrated counseling approach in individual, group, substance abuse, supervision and family/couples formats with children, adolescents and adults. Semancik is currently working on a Ph.D. in Psychology.